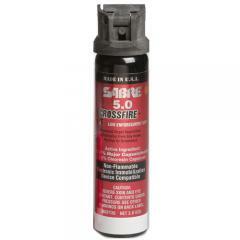 Walk with peace of mind while carrying the protection of the Sabre 5.0 Crossfire MK-4 Stream Spray 3.0 oz. Optimized for defensive application, the sprayer utilizes 3rd generation technology to allow the Crossfire to deliver a powerful stream of spray from downward, horizontal, and upward positions as well as everywhere in between. The easy access top trigger is easily reached for rapid deployment in high-stress situations. Once deployed, the Sabre's fast acting formula uses its 5% OC and .67% major capsaicinoid potency to immediately inflame the nose, ears, eyes, mouth and throat of its target for instant immobilization. With a range of 15-20 feet, the MK-4 is guaranteed to keep attackers at bay.